Foundation Legal Director Ralph Fucetola JD takes a look at the Nuremberg Code and other sources of International Law to conclude that Forced Vaccinations are a Crime Against Humanity. After the horrors of the Second World War, including the murder and abuse of millions with the complicity of the “health care” authorities of various warring parties, the international community developed conventions and declarations to the end that “Never again!” would the health system be used to harm either individuals or whole populations. Among these were the Universal Declaration of Rights, Geneva Declaration and the Nuremberg Code. Informed consent is under attack worldwide. Right now there are laws pending in two dozen US states that will abolish or restrict our hard-fought religious and philosophical conscientious objection exemptions to forced vaccination. Bills are being introduced on the federal level to require all Head Start children to have every vaccine “recommended” by the CDC. 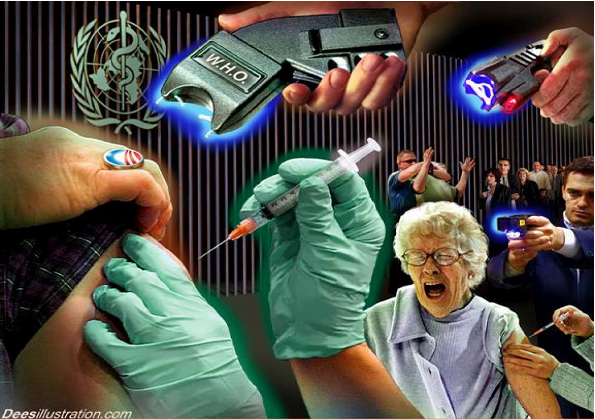 A new Adult Vaccine Schedule is being promulgated by CDC which will be used by private and public employers and state governments to require ever more adult vaccines… and there are another 200 new vaccines on the way! Australia, another “advanced” country with very high infant mortality and a large number of “recommended” infant vaccines, has just abolished religious conscientious objections to vaccination and will deny welfare benefits to non-vaccinating children. Meanwhile in Kenya the Catholic Bishops expose mass vaccine-induced infertility. Earlier similar exposure occurs in the Philippines and Bangla Desh. “Polio-free” India is shown to have 60,000 cases of “non-Polio flaccid paralysis” – afflicting only the vaccinated. See:http://tinyurl.com/DrRimaIndiaPaper. But in Australia the vax-pushing Prime Minister (whose three daughters did not receive the very dangerous Gardasil vax) wants to force all poor families on government assistance to receive all “required” vaccines. In Japan vaccines during infancy are being abandoned, while the USA and Australia, with the highest numbers of infant vaccines are also among the worst in infant mortality. While we are told that “correlation is not causation” we also know that there is always correlation when there is causation, which is strongly suggested by this comparison of two graphs from a government-published study. What we do below is show the two graphs together. What the graphs show is that, in general, the more required infant vaccines the worse the infant mortality. This litany of drug-pusher predation is especially heinous since the most vulnerable among us, our own children, are its main target. But is it more than just greed blinding people to the harm they engender? Is it more than just one more tentacle in the global elite’s depopulation agenda? Is it, perhaps, also literally a crime against humanity? With one scientist suggesting that by 2025 half of all US children will be diagnosed on the autism spectrum [ http://themindunleashed.org/2014/10/mit-researchers-new-warning-todays-rate-half-u-s-children-will-autistic-2025.html ] the very survival of our civilization appears to be at stake. Even if the genomicidal (genomic genocide) result merely flows from self-serving, crony-corporatist, pseudo-science, the absolute right of the individual to freedom of choice in health care is being denied. And people are dying as a result. And that violates not just the letter, but especially the spirit, of humane health care and the Nuremberg Code..
Doctors and nurses who needle unwilling persons, and the politicians that enable the trespass and assault, commit a crime against humanity.